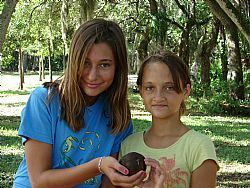 SARASOTA, FL – Bay Guardian volunteers with the Sarasota Bay Estuary Program (SBEP) and guides with Around the Bend Nature Tours will participate at the fourth annual Air Potato Roundup at North Water Tower Park on Saturday, April 14. The volunteer work project will run from 9 a.m. to noon and the park is located at 4700 Rilma Avenue in Sarasota. Air potatoes are an invasive species and prior Bay Guardian events at the park have focused on removing the plant. The April event is supported by area disc golfers including members of the Sarasota Sky Pilot Disc Golf Club. North Water Tower Park has one of the most popular disc golf courses in the region. Guides with Around the Bend Nature Tours will provide educational insights and lunch will be provided to the volunteers. The Sarasota Bay Guardians is a family-friendly volunteer program that SBEP manages in partnership with Around the Bend Nature Tours. The program was established to attract volunteers interested in helping restore Sarasota Bay. New volunteers receive a blue tee shirt featuring the Bay Guardians logo. You can sign up to participate as a Bay Guardians online at sarasotabay.org. Local school and church groups interested in volunteering can also contact Sara Kane.